Bleach: The Movie 4 - Hell Verse (2010 - 1 hr, 30 min, 04 sec) is the fourth Bleach feature, directed by Noriyuki Abe. I guess they are working on the premise that if it isn’t broken, don’t try to fix it, as Ichigo goes on a very familiar rescue story, the sort that was introduced in the first season of the show and repeated ad infinitum. Along the way the group get to fight, use new moves and generally cause havoc in the name of the greater good. With a new environment to play with Bleach introduces a new set of adversaries, the Unforgiven, who have captured Ichigo’s sisters in order to force him to break the gates of hell. Not being a deep thinker or a great ponder of consequences, Ichigo accepts an offer from a sinner, Kokutō, to traverse into the depths of hell, accompanied by Rukia, Renji, and Uryū. Ishida little realises that he is being played. Although the story arc is overly familiar, the environment of Hell is well imagined and using Ichigo’s sisters as bait allows for Ichigo to realistically emote and develop as a character. The condensed time, compared to the show, which would have stretched this out to twenty episodes, makes for a much more enjoyable watching experience. I was sent an odd selection of discs. 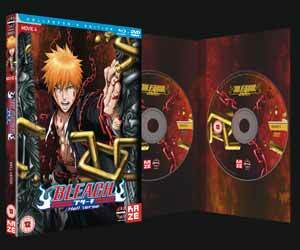 The PR sheet shows the package as a two DVD set, as well as prices for the DVD version and the Blu ray. What I got was a copy of the film on each of the formats, but no second disc. There are no extras on either of the supplied discs and no indication of what the second DVD contains. I’m suspecting that neither of the formats contains extras. The picture on the DVD is sharp, which makes the best of the anime's animation. This only gets better on the Blu-ray, with its 1080 picture and the 1.85:1, aspect ratio, widescreen presentation. With only a tenner between the two you really should pick up the Blu-ray, if possible. Audio options are either the original Japanese theatrical track, with English subtitles or a reasonable English dub. This is possibly the best film so far and also the best way to appreciate the best aspects of Bleach without having to suffer the endless repetition of the television show.